When Nicole Castro, the most popular girl at her high school, has her face splashed with acid, her classmate, loner and brilliant hacker, Jay Nazarro, does more than just gawk at her. He decides to find out who did it. The deeper he digs, though, the more he falls for Nicole…and the more danger he’s in. Everyone is a suspect—even Nicole herself—and whoever did it seems ready to strike again. 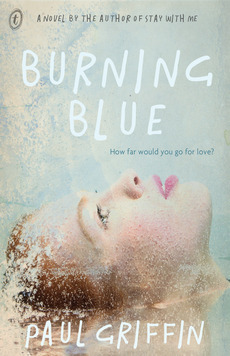 Burning Blue is a high-stakes, soulful mystery that explores just how far love, or the other side of love, will take us. Burning Blue wasn’t what I was expecting, I thought it would read like a thriller, and that the main part of the story would be how this once beautiful teenager copes with the new reality, but there’s a whole lot more to this story. This book manages to be both a gripping thriller, and a more profound emotional story all at the same time. The burning takes place in the first few pages, and figure in a hoodie squirts Nicole in the face with battery acid, and her life is changed. There is a brief description about the damage done, but Nicole stays bandaged up for the rest of the story, and for me it isn’t the focus of the story. Jay is a great character, a computer genius (hacker), good looking, but a loner. His acceptance by the general population at school is hindered by the fact that Jay suffers from a form of epilepsy, and a seizure in front of the whole school, where he lost control of his bladder, has made him quite the target. In fact the humiliation was so bad, that he convinced his father to let him be home schooled for a year. Jay is just returning to school, while Nicole is still at home recuperating. Their paths cross outside the school councillors office, and while their situations are totally different, each has some understanding of what the other is going through. The thread that runs through the whole story is of Jay’s mission to find Nicole’s attacker. Using his skills as a hacker, as well as some old fashioned detective work he is determined solve the case. As with any good mystery, the suspect list is long, and Jay works through it eliminating as he goes, there is even a possibility that Nicole may have done this to herself. As well as this we also have Jay’s more emotional story, that looks at the death of his mother, and the complicated relationship he has with his father. The funny thing about Jay is that his physical appearance is not really described, apart form the fact that he refuses to get his hair cut. The loner personality and his penchant for computers made me pigeon hole him as an ordinary looking geeky guy. It’s not until the story develops and we see more of his personality come through, and we start to see him through other peoples eyes that he’s described as ‘hot’, and the way he deals with the local detective we see he’s more than a little bit charming. The story is told in alternate chapters, so while this book may look quite girly from the cover I think it will appeal to teenage boys just as much as teenage girls, and that’s quite a rare thing in books for teens.